Remember this post when I said rely on your inner graphic designer and try your hand at making your own wedding invites? 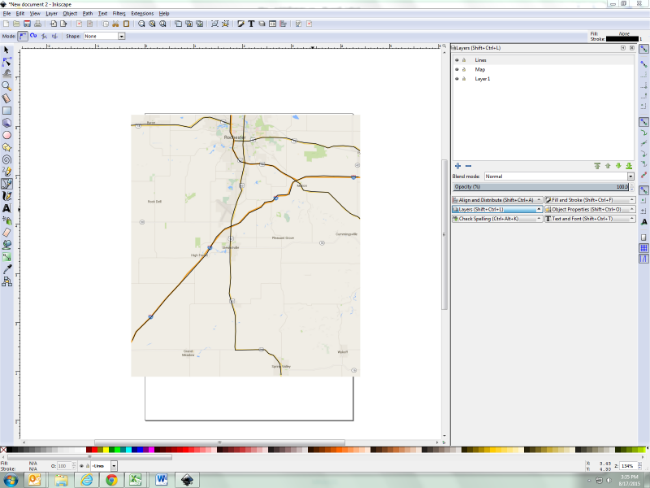 Well today I come with a little back up and an easy tutorial for making a custom map of your wedding day activities. I know maps are a little unnecessary with your map apps and your gps’, but they’re so pretty! 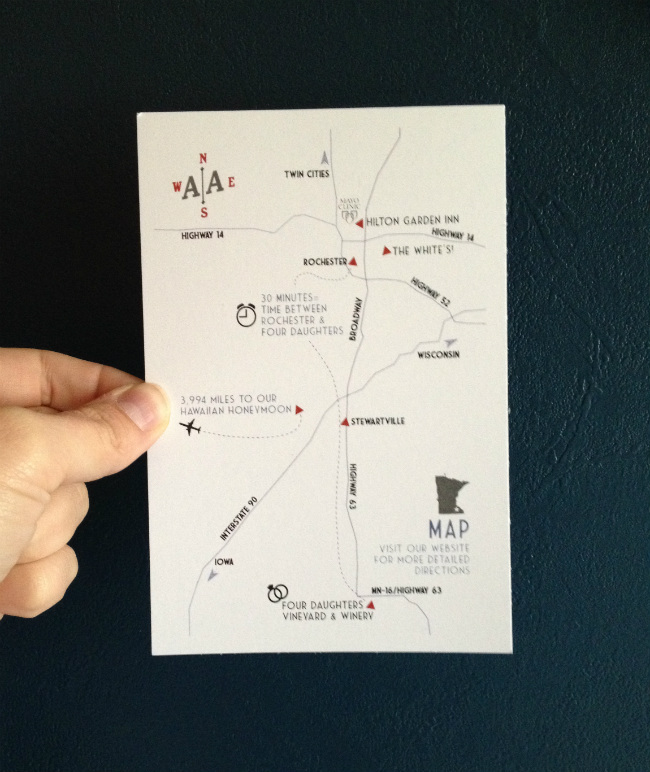 I’ve always thought a simple (or intricate) map really amplifies an invite. It sets it apart, makes it look fancy. Details like this subliminally set the tone for your event and step it up a notch. With this tutorial, all you’re really adding is the cost of printing (a mere $36 at my local print shop). 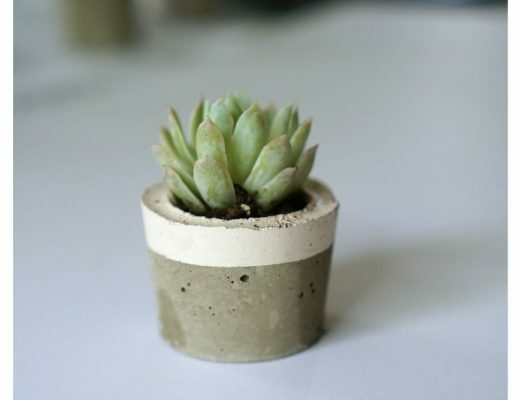 Check out some great ideas on my pinterest board. Plus it’s a fun keepsake after your event. To start, make sure you have Inkscape downloaded on your computer. It’s my favorite, free vector design program that is both powerful and easy to pick up – even with little design experience! If you’re a pro at powerpoint or other Office products, your learning curve will be pretty low. Full tutorial after the jump! 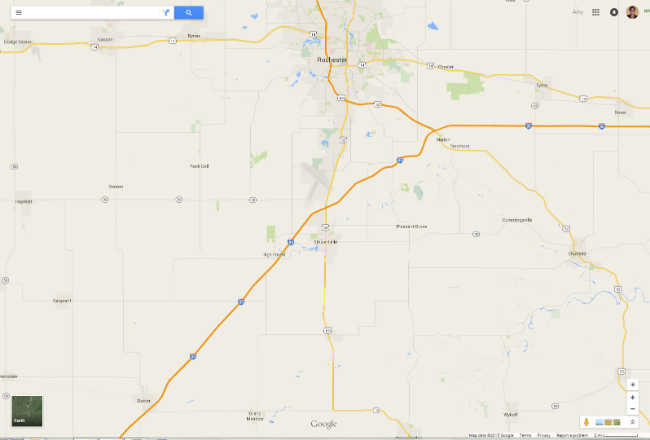 Step One: Open Google Maps in a browser and zoom in or out so all of your points of interest are on the screen. Start with your basics – where your ceremony is, the reception venue, the hotel and then if it makes sense, add some fun, personal things like the best place to grab a drink in between your ceremony and reception or where your first date was or arrows to where your honeymoon is. Don’t go overboard and keep in mind this has to be printed on a small area so use digression, but a few personal adds are fun. Once you have the area zoomed in, take a screenshot or use a snipping tool (or command + shift + 4 on a mac) of the area including all your points of interest. This will automatically make a png image saved usually to your desktop. My points of interest below were quite far away (in different towns! ), so I had to keep it pretty general, but I still made it work. Step Three: Using the transform arrows on the corners and sides of your snippet, resize your newly imported file so your snippet fits on your document (which will be a box on your screen). Step Four: Set up your layers. Layers are simply one thing (text, images, filters, etc.) stacked on top of another thing in one document. 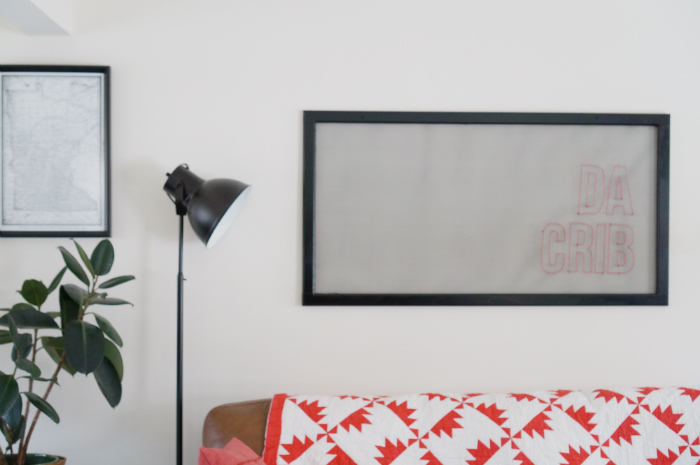 They’re great because you can try certain design elements or filters and then either hide, display or change the opacity of your layers without deleting the work. When you begin a new document, everything will automatically be on Layer 1 (if the layers menu is not on already on right menu bar- click on the layers option in the bubble menu – it’s in blue below – and your full options will appear). Start by adding a layer: “Layer – Add Layer” and name it “Map.” Repeat the process and name your second layer “Lines” (or whatever you want to call it). You will then arrange your layers by dragging and dropping one layer above or below the others. From top to bottom, you’ll want your layers to be: Lines, Map. Layer 1. 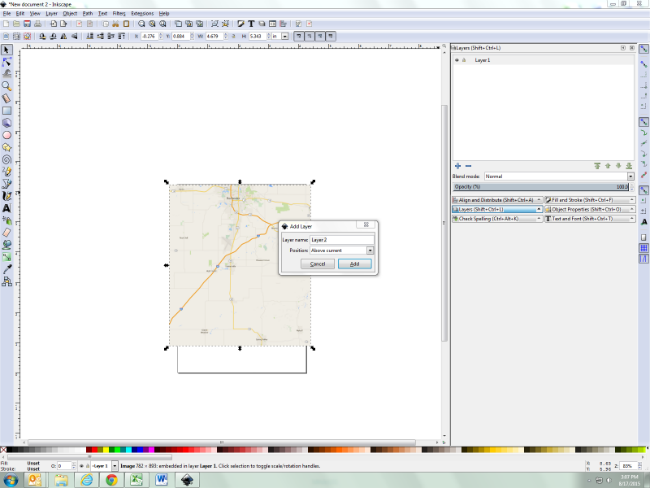 You’ll then want to move your map snippet to your Map layer by clicking on your map, right click, choose “Move to Layer – Map.” Reduce the opacity of your map later (this option is right below the blend mode on your right column menu) to 50%. This will act as our stencil. 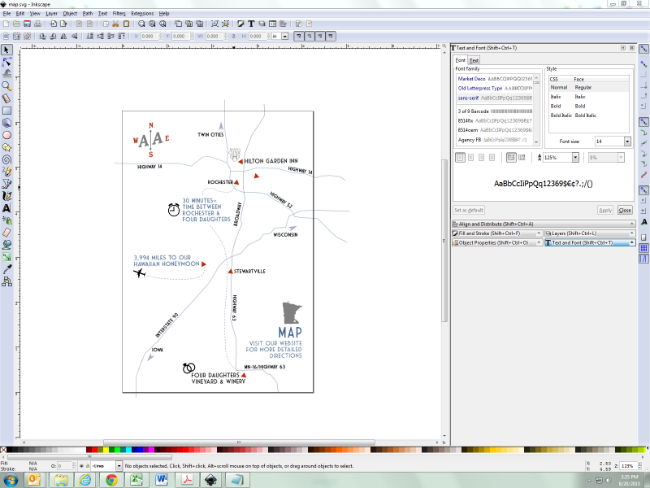 Step Five: Now that the map is placed on your document where you want it and in the right layer, ready to act as a stencil, we’ll work in our next layer: Lines. In the Layers menu make sure the Lines layer is selected. From there, we’ll switch over to the left menu where our document editing tools are and select the pen tool. This tool is used to create lines and curves. 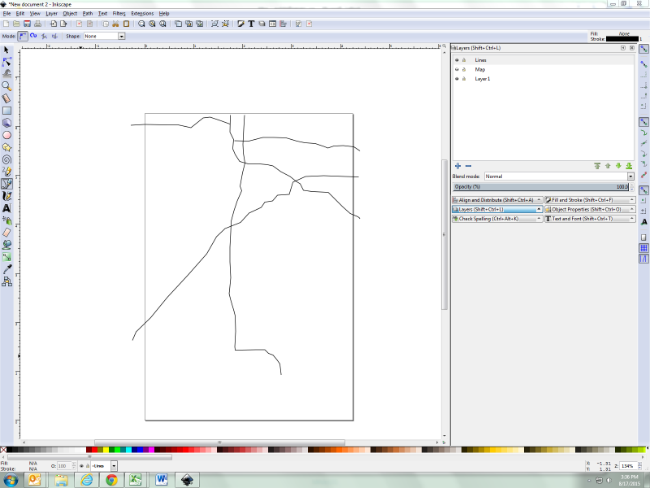 We’ll start with tracing our main highways and roads as I’ve done below. To create a line, simply click your way along the lines on the map. To finish a line, double click on your last point. Repeat until all major roads are traced. It doesn’t have to be perfect! 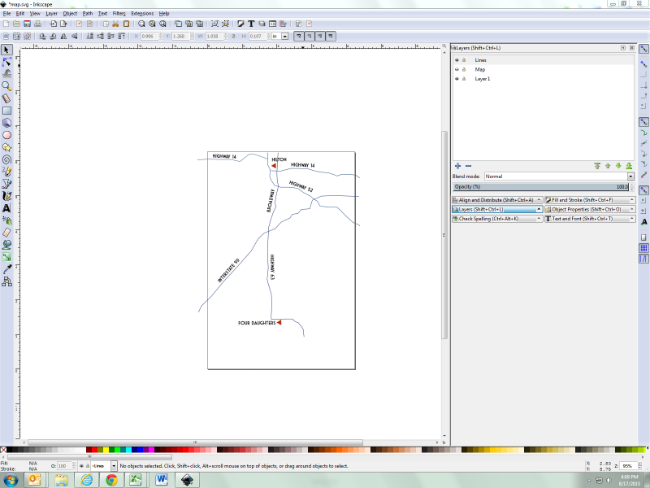 Step Six: Next, hide your map layer to reveal the backbone of your custom map! To do this, simply head to your layers menu on the right side of your screen and click on the eye icon next to the Map layer. When the “eye” is open, the map is in view, when the eye is closed, the map disappears. Ah, the power of layers! 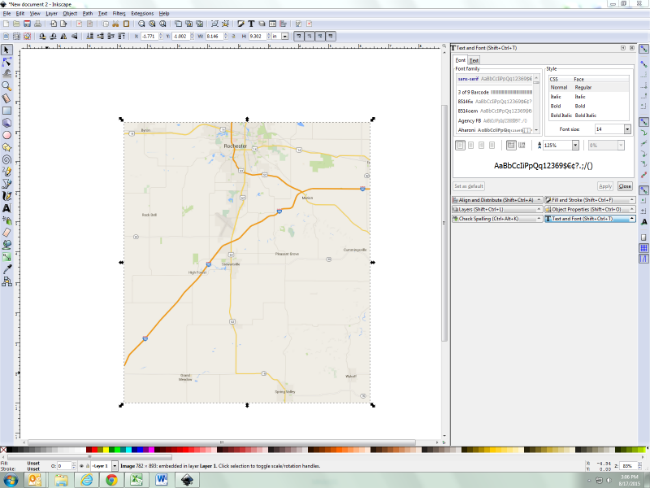 Step Seven: Now it’s time to fill in your map. If you want to keep it basic and easy like I did (this works best when your main points of interest are far away), choose an icon (ie. triangle, circle, etc.) to indicate your main points. Using the tools menu on your left menu bar (the text and shapes tool), fill in the basics first: where the ceremony takes place, the reception venue, different towns, label the main roads, directional arrows, etc. Keep in mind to use the same fonts and color scheme as the rest of your invite suit. This can be altered in the Fills and Stroke menu. Step Eight: You’re almost done! And now for the fun part: Add as little or as much flair and personal zing as you want! Again, err on the side of less is more. You really will want your map to be as clear as possible and too much flair can be confusing. In addition to my main points, I added in an icon for our Hawaiian honeymoon, the time it takes to get from our reception venue to the hotel, and arrows from the different directions from which our guests are coming. Don’t forget about directions! After all, that’s the main reason for your map. I pointed people to our website for detailed directions, but if you have room on your insert, you could put some basics on same or even the reverse side. Once you’re done with your designs, save as a PDF and send on to your local printer or even print on your own inkjet printer. Your guests will rave. Did I miss a step? Have a question about Inkscape? Leave a comment and I’ll be sure give further instruction!